When the Ford Mustang was first unveiled - at 1964's New York World Fair - it triggered a tidal wave of excitement. Thereafter, it became one of the fastest-selling cars in history. It took the Mustang just two years to pass the million mark. The car had the '60s Zeitgeist written all over it! Lee Iacocca was the whizz-kid Ford exec who conceived the car. It had all-American looks, in abundance - but the real beauty of the Mustang was its long list of extras. Everything from the engine and gearbox - to the handling and braking - was ripe for user input. Trim options were legion! If all you wanted was to cut a dash in your new Mustang, the straight-six motor was more than sufficient. If you preferred more poke, there were V8s. They ranged from 195 to 390bhp. Front disc brakes were a wise choice! Standard suspension was sufficient for most drivers - coil-spring and wishbone up front, and a beam axle on leaf springs at the rear. Of course, a stiffer set-up was there, if needed. As for the gearbox ... it was a choice between a 3-speed auto, or a 3/4-speed manual. At full gallop, the standard Mustang made 130mph. If you wanted more, there was the Carroll Shelby take on the car. 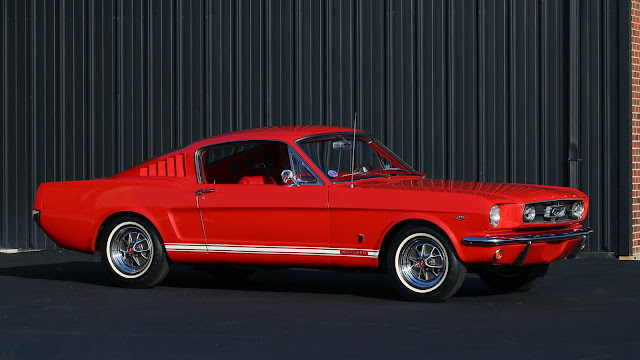 A road/race hybrid, it was based on the GT350 fastback. It subsequently grew into the 7-litre GT500, making 425bhp. The most iconic Shelby Mustang of all was the GT390 - star of the film Bullitt. Well, along with Steve McQueen, that is! After that, 'pony cars' were hot to trot. Rival manufacturers fell over themselves to build their own 'Mustangs'. But, neither they - nor, indeed, Ford - cut it quite like the original. Later versions - with added flab - lacked the simple, but strong styling of their predecessors. For many an owner, the Ford Mustang was their entrée into the American Dream. Some planned never to wake up!